Automatic update of start and end tag were introduced with Visual Studio 2011 Developer Preview; where we were able to update HTML / ASP.NET Start and End tag automatically. Prior to the VS 2011 developer preview, we had to update both start and end tags manually for any kind of update on the tags. This is a very small but nice features, but it was limited to HTML/ ASP.NET controls tags. With Visual Studio 2013, you can take advantages of similar feature with XAML markup. 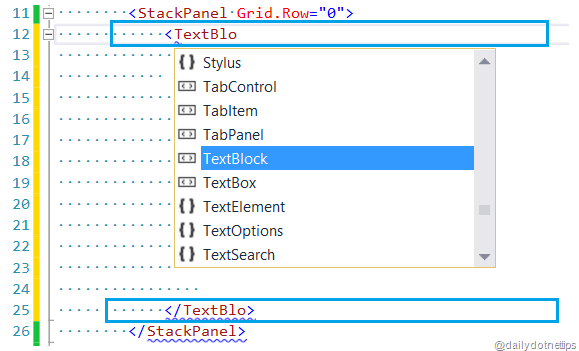 Now in XAML editor, if you edit any of the start or end tag, corresponding tag will be changed. There is another small enhancement within the same context. You can remove end tag by just providing an closer “/” with the start tag. Hope going forward you will apply this nice feature while working.